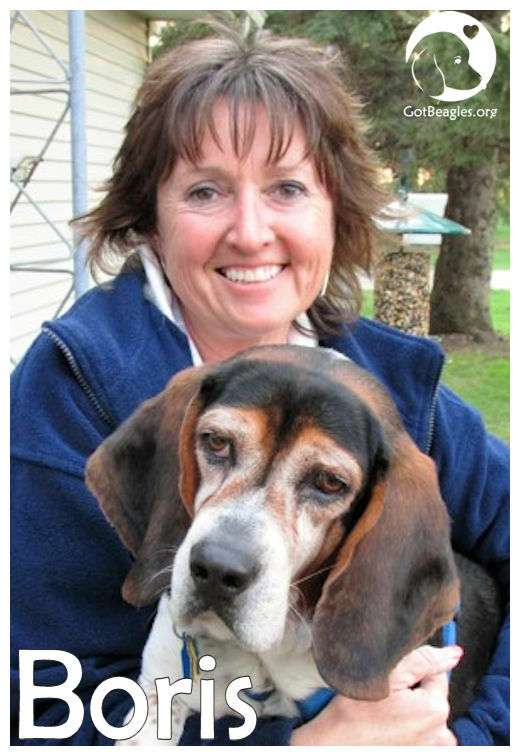 After losing our 13 year old Beagle, Gertie, to cancer, it took 3 and ½ years before we were ready for another dog. We found the Midwest BREW site and started the adoption process. Everyone at every step was wonderful to work with. They found us the perfect boy, Boris. He was in Ohio. We’re in Wisconsin. We met in Indiana so we could get him right from his foster parents. We connect with them at least once a week, as well as posts on Facebook so our adoption counselor and others who met him can keep tabs. Boris is perfect; 40 pounds of love. He doesn’t beg, doesn’t jump on the furniture, doesn’t chew on anything, doesn’t bark in the house and sleeps in one of his 2 beds from about 8:30pm until about 5am. He’s been wonderful with the neighbor’s kids, ages 8 and 2 and he ignores people and dogs walking by. He is sometimes startled by noises but the noon siren and thunder don’t bother him at all. Dinnertime is around 5 so at about 4:30 he will stare at me. He uses his most pitiful “Eeyore” look to make sure I understand he is dying of starvation. He’s not crazy about rain or heavy snow coming down, but other than that, would spend all day outside if he could. We have a large yard but not fenced in so he’s on a tie-out with one of us out with him. His favorite thing to do, and pretty much the only activity he cares for, is sniffing the ground and barking at critter scents. In the house, he doesn’t play but we’re working on that. He gets the zoomies almost every night after our evening walk and tears around the house, sliding around corners, just racing around. Then it ends as quickly as it started with him jumping in his bed and acting like he’s been there the whole time. Things we consider “progress” are him lying near us in the living room, not in his bed, coming to the door after we’ve been gone - with his tail wagging, or picking up a toy or ball. He doesn’t seek attention often but will come to us to get his ears or eyes rubbed. That makes him melt right onto the floor. We‘ll never know what brought him to be abandoned at a shelter. We try to focus on the future and give him all the love we can. He deserves it…like I said, he’s perfect!